Experience lake life in style when you stay at this 3-bedroom, 2-bathroom Vandalia vacation rental house. Boasting 2,000 square feet of living space and sleeping accommodations for 10, this home is the perfect getaway for families seeking a lakeside retreat. Situated along the edge of Donnell Lake, the property features a private dock and breathtaking views. Utilize the dock for days on the water or venture out and discover the golf courses, casinos, wineries and so much more nearby! Natural light pours over the open great room through a towering wall of windows that accentuate the home’s wood-paneled cathedral ceilings. Enjoy the views from the plush furnishings that fill the space, or turn on the flat-screen cable TV with XFINITY On Demand to catch up on your shows. A wood-burning fireplace surrounded by stunning stonework finishes off the space. Adjacent to the living area lies the dining area, where you can bring the whole family together around a charming wood table for a gourmet meal. Prepare tonight’s menu options in the fully equipped kitchen, which comes complete with everything you’ll need to cook all your favorites. A breakfast bar set for 4 allows you to keep the chef company while they work their magic in the kitchen. Spend some time in the game room, primed for entertaining afternoons at home. The space is brightly lit with natural light flooding through large windows and includes a cable TV, crafts table and sliding doors to access the deck. Bask in a cool lake breeze as you step out to your own outdoor oasis. Host a happy hour at the shaded patio table while dinner cooks on the gas grill. This incredible outdoor space also includes a lush yard and a private dock for you to enjoy unrestricted access to the water during your stay. After a full day on the water, retreat to the bedrooms for some much-needed sleep. The master bedroom comfortably accommodates 4 guests between a king-sized bed and 2 twin beds. Wash up before calling it a night in the full en-suite bathroom, equipped with double sinks, a walk-in shower and soaking tub. With a 246-acre lake as your backyard, you may never want to step foot off the property! Enjoy fishing, boating and swimming right out the back door, or venture out and explore a number of other nearby attractions. Four Winds Casino is a popular destination with 400 slot machines, table games and on-site restaurants that are sure to satisfy your hunger cravings! To learn more about the area’s history, visit the Dowagiac Area History Museum, a 6,000-square-foot exhibit highlighting the history of Dowagiac, Cass County and Sister Lakes. For those willing to take a drive, head over to South Bend, home to over 50 major attractions, including the Potawatomi Zoo, the Studebaker National Museum and the Morris Performing Arts Center. Take a trip out to Shipshewana, located in the heart of Northern Indiana’s Amish Country. Here, you’ll find unique baked goods and a wide variety of handmade quilts and crafts. If you’re planning your visit between May and September, be sure to stop by their famous flea market, open on Tuesdays and Wednesdays, with over 900 vendors, selling everything from clothes to antiques. Under an hour from the University of Notre Dame, this property is the perfect home base for parents visiting their kids! Plan your trip during football season and you can look forward to a fun weekend of tailgating and events near campus. Other local favorites worth a visit include the Diamond Lake Golf Club, Swiss Valley Ski & Snowboard Area and Lake Michigan beaches, along with wineries and antique shops throughout Southwest Michigan. Perfect for three couples get-together!! Everything was as described and as pictured. Except the grill. The men were rather disappointed that it was so dirty. The ladies cooked in the kitchen which was well supplied. Even caught a couple fish right out front. The contact person was in touch often to make sure everything was alright. It was rather cool to be grilling out anyway, so it wasn't that big of a deal. 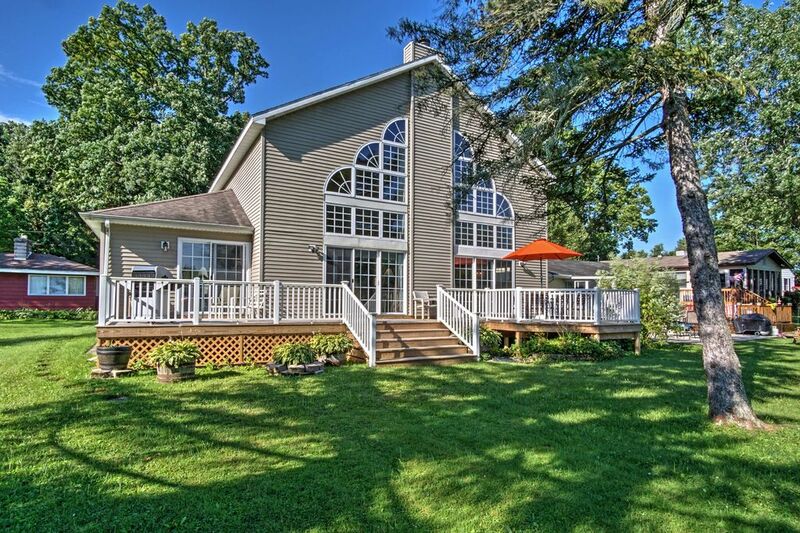 The home is built to capitalize on the beautiful lake view. We were in town for a wedding and did not have the opportunity to go out on the lake or even on the dock. The home has every amenity you could need, from a washer/dryer, multiple hair dryer's, fully stocked kitchen, multiple TVs, board games, and such. The driveway was a little narrow, be careful to park directly in the center, especially when it rains heavily. Home was also VERY easy to locate, thank you for the large mailbox numbers! If you are looking for a large space for a large group, with room to move, this is a great option! Only thing we didn't like was the front yard. I believe there isn't anything you can do about this. Plenty of room for our extended family. The great room is fantastic for relaxing in the evening with everyone. The lake is large enough for good skiing and tubing. We were provided with everything we needed so we didn't need to make any little trips to the store. (Linens, bath towels, paper products, spices, etc.) Property is as advertised. Clean and well-maintained. Nice 9-hole golf course nearby for a quick round. This lake property fit our needs well. The open floor plan and view of the lake was beautiful. The kitchen was supplied with everything we needed. I might suggest providing some lake "toys" for use along with beach towels.